A group of sockeye salmon school tightly as they migrate upstream in the Adams River. In reviewing some images I shot last year I realized I almost trashed this one during the initial edit. I’m glad I saved it, because in the months since I shot it last October it has really grown on me. 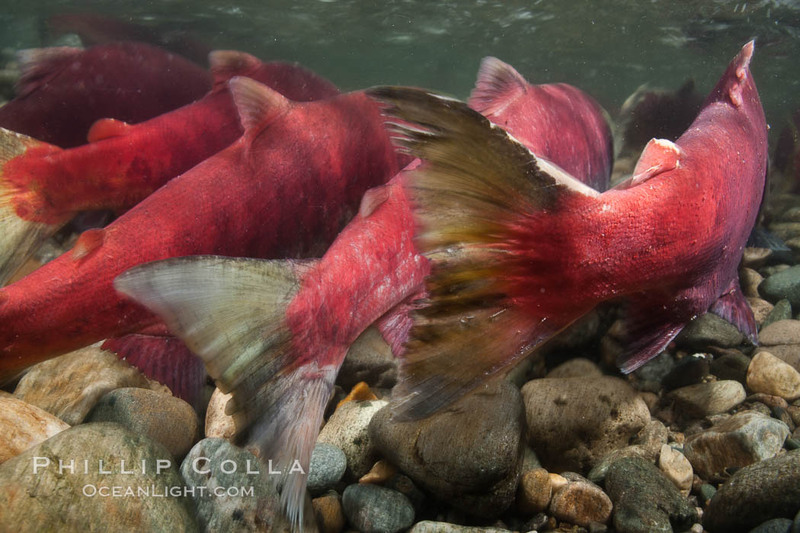 More than most of the sockeye salmon photographs (Oncorhynchus nerka) I made during my short day and a half at the Adams River, this photograph offers some intimacy and insight into the final weeks of life that sockeye salmon experience. The salmon migrate up the Fraser and Adams Rivers in large schools. At times they are “shoulder to shoulder”, pressed up against one another as they struggle against the neverending downstream current. Their bodies take on a rich crimson hue in their final weeks of life. That the color is “blood red” is poetic in a sense; it signifies their impending doom. They are struggling in the contest of their lives and even those individuals that successfully travel hundreds of miles from the Pacific Ocean to reach the spawning ground and produce eggs or sperm will still die. But perhaps the most appealing detail in this scene is the damage the salmon sustain in their migration. In the thousands of photographs I made of the spawning sockeye I did not see a single uninjured fish. Virtually every fish that reaches the Adams River looked “seriously thrashed”. Most injuries were contusions on the leading edges of the fishes jaws and head and on the dorsal, ventral and caudal fins. These appear to have arisen from collisions with rocks, branches and other obstacles that they slam into as they throw themselves upstream. It is a brutal pursuit. I have a newfound and keen appreciation for the hardiness of sockeye salmon after seeing the end of their migration firsthand and I hope the photographs I made will help convey that appreciation as they are used in publications in coming years. Sockeye salmon, migrating upstream in the Adams River to return to the spot where they were hatched four years earlier, where they will spawn, lay eggs and die. Photography efforts undertaken by permission of Fisheries and Ocean Canada and BC Parks.